“From cookie cutter to custom”… that’s the mantra for this season of Sarah’s House. Sarah & Tommy bring style to the suburbs and aim to prove that you can add a custom touch and make your builder’s box look a little less like the box next door. To inject the personal stamp she’s hoping for, Sarah decides on a new build house in the Mystique subdivision by Double Oak Homes in Georgetown. From picking the lot, selecting the floor plan, and deciding on the finishes, Sarah & Tommy are involved from the ground up. - Check out the neighbourhood. Are there good amenities nearby like a school, park, or ravine setting? Sarah decides on the Rouge River model, a $730K Georgian inspired, 2 storey, 5 bedroom, 4 bathroom home with 3700 sq ft. that comes with a $100,000 upgrade package. The first order of business: tweaking the floor layout. 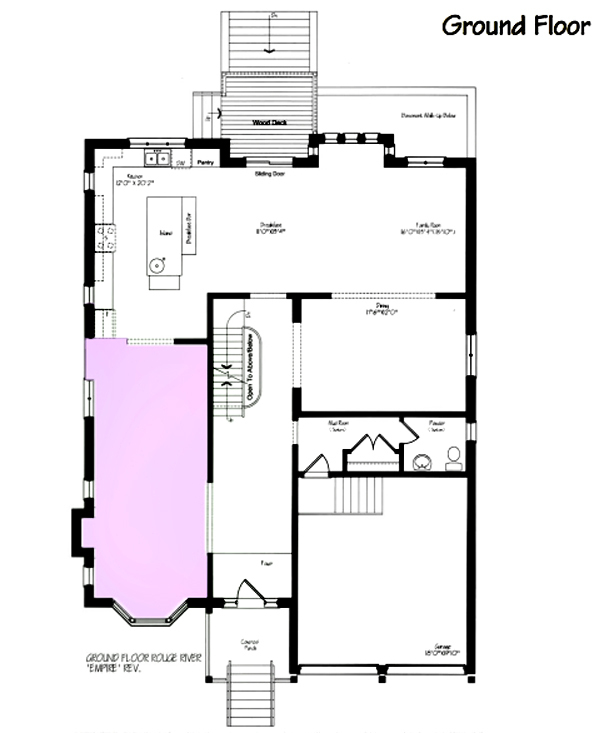 Sarah decides to combine the living room, powder room, and bonus room to create one large living room space (lilac area), and flip locations of the kitchen and living room. Since these changes were requested at the construction stage and only involve opening partitions and not reframing of the house, they can be made (at an additional cost of $2500 for engineering fees). She decides against upgrading the standard builder floor with the thought of using those upgrade dollars instead to put marble floors in the ensuite – best to spend the money on floors you see instead of those covered with rugs and furniture! 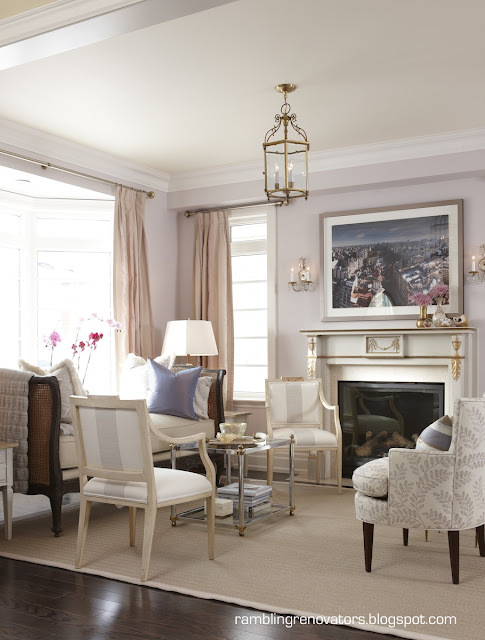 Inspired by a lavender shell ball, the living room is given an elegant neutral look. An eclectic mix of chairs are purchased from Furnishings On Consignment, The Elegant Garage Sale, and Queen West Antique Centre along with a daybed from GH Johnson and a splurge of a custom made sofa. An old mantle from The Door Store brings instant vintage appeal to the new space and draws you in. All the seating is upholstered in neutral fabrics, a classic look that can be updated by changing out accessories. A mix of warm and cool metals and a herringbone seagrass rug add texture and tone. - The best paint colours will never hit you over the head. They speak quietly and softly. - Its okay to have a mix of masculine and feminine rooms in your home. This ensures there’s something for everyone! And the final tab on this room… $26,988 for the upgrades and décor. What did you think of it?